The Daily Mirror has said sorry to the regiment it accused of torture after publishing fake pictures of UK troops abusing Iraqi prisoners. The Queen's Lancashire Regiment (QLR) accepted the apology but called for the newspaper to help root out those responsible for the photos. 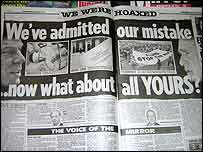 Following the sacking of editor Piers Morgan, the tabloid also apologised to readers and to UK armed forces in Iraq. The QLR said the Mirror had endangered British troops by running the pictures. "They should, as they've promised, help us out with trying to root out whoever was responsible for producing these faked-up photographs," said Brigadier Geoff Sheldon. "Clearly if it turns out they were members of our regiment we do will do everything we can to deal with these people who have played a disgraceful part in this." One photograph showed a soldier urinating on a hooded man while in another the hooded man is being hit with a rifle in the groin. 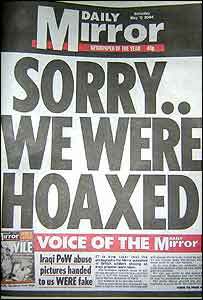 In Saturday's edition, the Daily Mirror admits the photographs were fakes but says they "were printed in good faith". It continues: "We absolutely believed they were what we were told they were, otherwise we would never have printed them." An inquiry by the Royal Military Police (RMP) had said the truck shown in the photographs was never in Iraq, and on Friday the QLR demonstrated to reporters aspects of uniform and equipment which it said proved the photographs were false. Mr Morgan had refused to resign saying "We published the truth", but the newspaper now says the pictures were part of a "calculated and malicious hoax". The BBC's Nicholas Witchell said it appeared Piers Morgan remained "unrepentant" right to the end. "According to one report Mr Morgan refused the demand to apologise, was sacked and immediately escorted from the building," he said. The former editor will be replaced on a temporary basis by his deputy, Des Kelly. Downing Street and the Ministry of Defence have declined to comment on Mr Morgan's departure, but press reports have said that military chiefs were privately celebrating. Earlier Colonel David Black, an ex-QLR commanding officer, had pressed for Mr Morgan's departure. He said: "It's time that the ego of one editor is measured against the life of the soldier." An RMP investigation into alleged abuse by British soldiers of Iraqis is still continuing. One of the Mirror's informants - Soldier C - said there had been abuse in Iraq. The Territorial Army soldier has been questioned by Royal Military Police after talking about his claims to the newspaper. And on ITV's Tonight With Trevor McDonald on Friday he said: "It did go on, it wasn't all the army, it wasn't systematic but it did happen." In Saturday's edition the Daily Mirror is also still refusing to leave the issue alone. It said: "Four others have told similar stories. No evidence been produced to disprove what they said." The Sun newspaper had offered a £50,000 reward for "information about the fake Mirror photos" but withdrew the offer following the sacking of Mr Morgan. "Today's front page said it all"